The traditional and elegant carving design Wooden Beds belonging to classic category reflects the vintage philosophy perfectly well. The head board is made straight for optimal support, while the base frame is made out of hardwood (teak) to ensure no sagging, shrinking, or swelling. The base cavity holds the mattress in place for composure and adequate rest. The block legs hold the top frame with their articulate strength without wobbling or shaking. It is also highly comfortable, and will help you embrace slumber in the most organic way. 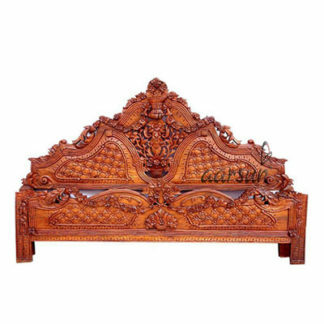 Wooden Beds available in single, queen and king size, and is made of highly durable wood. The structure can be created out of Sheesham or Teak wood, and the finish can be selected out of a list that has options like natural, walnut and dark walnut. The rich solid wood texture adds a sophisticated look to your bedroom. The traditional and elegant carving design belonging to classic category reflects the vintage philosophy perfectly well. The head board is made straight for optimal support, while the base frame is made out of hardwood (teak) to ensure no sagging, shrinking, or swelling. The base cavity holds the mattress in place for composure and adequate rest. The block legs hold the top frame with their articulate strength without wobbling or shaking. If you love the natural grains of the wood and want that rustic look to be incorporated in your bedroom. 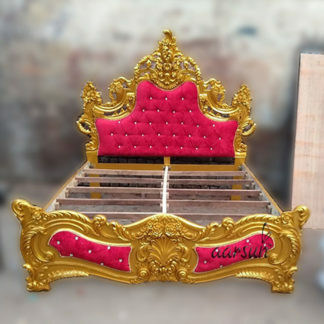 These Wooden beds are available in options such as Sheesham and Teak. You can also customize the size as well as finish of the bed to blend it as per your home decor.